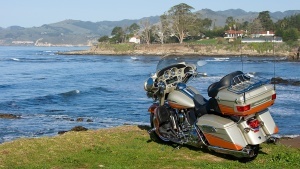 I rode several of the 2009 Harley-Davidson touring models up the California coast recently, and I was able to experience their improved capabilities. I'll be writing about each model separately in upcoming articles. The 2009 touring models are all new from the ground up. Key changes for 2009 include new modular frame, swingarm, engine mounting system, and wheels and tires. With a 'ready to ride' weight of over 800 pounds Harley-Davidson's touring models are massive bikes designed for all day comfort while crossing vast stretches of highway. Many manufacturers chase the style of the day, but the new 2009 touring models incorporate major improvements while retaining the character and styling that defines Harley-Davidson motorcycles. 2009 Harley-Davidson Touring Chassis: Photo courtesy of Harley-DavidsonThe new robotically-welded touring chassis based on single-spar, rigid back bone frame combined with the new swingarm insures improved quality, versatility and stiffness. The modular design accommodates new models like the Tri-Glide Ultra Classic by changing the rear section. 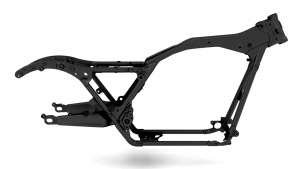 The new longer, wider swingarm is matched to the new frame design and is 30% stiffer than previous designs. The 2009 motorcycles are only 30 lbs. heavier but GVWR is increased by 101 lbs. Front forks have been re-tuned for a 33% increase in spring rate, the rear shock rate has been increased by 5% and damping is recalibrated at both ends. On the road, the new suspension gobbles up bumps and pavement imperfections. The ride is comfortable, confidence-inspiring, and mid-corner bumps are barely noticeable—a pleasant surprise as I found myself completely at ease riding at a brisk pace on sweepers and back roads alike. The standard Twin Cam 96™ has 92.60 ft. lbs. of torque at 3,500 rpm (the Screamin’ Eagle models have 115 ft. lbs. At 4,000 rpm) passing is as easy as a twist of the wrist in any gear. The 6-speed transmission shifts are smooth and quiet. I was impressed with the light effort and precise shifting. I admit that I'm not accustomed to the heel shifter so I toe shifted most of the time. The Engine Idle Temperature Management System (EITMS, A.K.A. "Parade Mode") is now rider engaged by rotating the throttle forward for several seconds. In hot weather when the motorcycle is stopped in traffic the rear cylinder's fuel and spark are shut off to reduce heat felt by the rider. 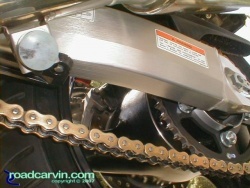 A new 68 tooth rear sprocket improves acceleration. Harley-Davidson and Dunlop co-designed the Dunlop 407 bias ply tires specifically for the 2009 Harley-Davidson Touring models. The tires feature a dual compound, harder center for longer life while riding straight up and a softer compound on the edges for improved cornering traction. During my ride, the tires performed well in wet and dry conditions. All bikes I tested were equipped with ABS brakes. I did not notice any effects of the ABS system during the ride even in the heavy rain. The Brembo brakes are powerful and easy to modulate. The rear brake works well with good feedback from the forward mounted pedal. Riding a combination of mountain passes, in-town, freeway and twisty back roads was comfortable and enjoyable. To my surprise there was never an issue with ground clearance riding at a brisk pace on a variety of twisty roads. I found the riding position to be quite natural, and seat comfort was excellent even after a day in the saddle. 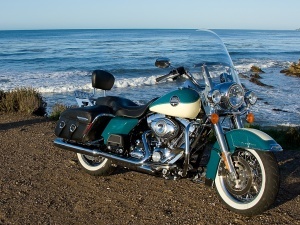 According to Harley-Davidson the touring models are their best-selling class. After riding these touring motorcycles for the first time I understand the appeal. Why upgrade to a 2009 H-D touring model? 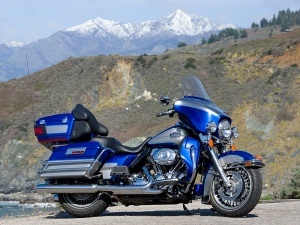 If you are a serious long-range road rider, the 2009 Harley-Davidson touring models offer a complete package that are worth a look. Submitted by Brooksie (not verified) on May 24, 2009 - 7:30am. I have been bouncing back and forth between an HD Tour and the Triumph R3T. Love the power of the R3T, but it sounds like if it goes down, I could be without a ride for weeks. Haven't decided on which HD, maybe the FLHX, but I appreciate your article.